The noise figure measurement personality (opt219) of the PSA Series spectrum analyzer provides fast, one-button noise figure and gain measurements from 200 kHz up to 26.5 GHz. DUT setup menus help guide you through amplifier and mixer measurements, and a built-in measurement uncertainty calculator makes it easy to qualify your measurement system. 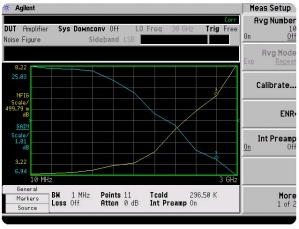 An optional internal preamplifier (Option 1DS) improves instrument uncertainty to ±0.05 dB below 3 GHz, so you can conveniently and accurately measure devices with low noise figure.